The 38 Princess Coronation class locomotives built by the LMS at Crewe works between 1937 and 1948 were some of the finest ‘top link’ steam locomotives built in the UK. For a while, no. 6220 held the world speed record at 113 mph although this did not last too long. The Princess Coronations power output of 3300hp was never surpassed in the UK though. IN 1939, 6229 Duchess of Hamilton swapped identities with 6220 Coronation and was shipped off to the USA to attend the World’s Fair. Arriving in Baltimore, the loco and a set of articulated carriages were unloaded and dispatched to the Baltimore and Ohio (B&O) depot at Mount Clare and used in a number of publicity films and photoshoots. 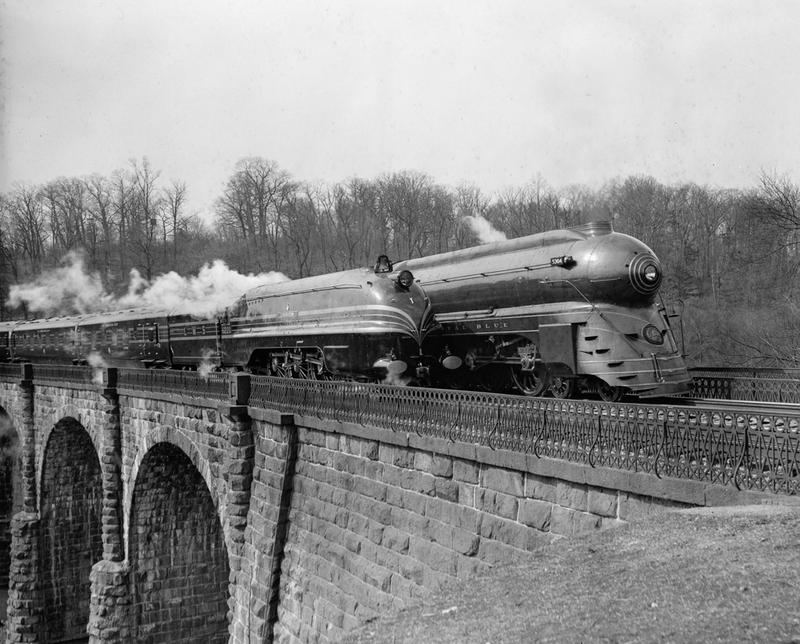 The most popular ones were of her were on the Thomas Viaduct with her B&O Railroad contemporary the ‘Royal Blue’. To allow her to run on American metals, Crewe Works had installed an American bell, head lamp and buckeye coupling, and after leaving Baltimore, the train went on a 3000 mile tour of that covered Washington, Philadelphia, Pittsburgh, Cincinnati, Louisville, Indianapolis, Chicago, Detroit, Cleveland, Buffalo, Albany, Boston, Hartford and many others before arriving in New York to take it’s place at the World’s Fair. During the time of the exhibition though, events back home took a turn for the worse and Britain declared war on Germany. It was decided to be too risky to send the train back, so the loco was stored by the B&O at its Fell’s Point facilities in Baltimore and the coaches were taken to Jeffersonville, Indiana where they were used as living quarters for the US Army Quartermaster Corps. The locomotive was returned to the UK in 1943 and on her return to Crewe, she swapped identities back to No. 6229. Duchess of Hamilton is now preserved in fully streamlined condition at the National Railway Museum in York, and looks splendid! It is interesting to note how small she looks in comparison to the American loco, which by US standards, is not huge. I can highly recommend ‘The Duchesses’ by Andrew Boden, a very readable account of the class, more so than most railway books. “Crewe Works” is no longer. Bombardier plus, Pete Waterman both have rail related works in Crewe, mainly restoration and, refurbishment areas. ( My father worked on BR, in the goods side of things before becoming a Union rep for the TSSA. Thanks for the comment, yes Crewe and all the other big works are now either repair shops or closed down completely. The only remaining manufacturer is Bombardier in what used to be a carriage works.